Giordano Rosati and his Cantiere Azzurro represent a special world in which professionalism and craftsmanship of the old days go together and where the precious and sophisticated work of the master shipwright combines with innovation. The boats of the Azzurro Shipyard are completely built with woods of the best quality by skilled craftsmen and they are customized to the most demanding Owner's taste and requests. All Azzurro boats are marked by special characteristics that make leisure motor boating unique. We tested the most recent product of the yard, a beautiful pilot- boat with a pure and solid outside line, created for outstanding performance and safe navigation, with an interior habitability half way between a classic vessel and a modern sports boat, for a rational and practical sea life. The photographs show the beauty of this boat that combines safety with comfort, maneuverability with practicality. The boat has several striking characteristics. 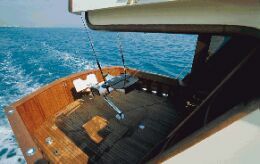 The cockpit design with low sides contribute to a more slender outside line and considerably facilitate fishing operations - on the contrary, the leisure version has higher cockpit sides. The Owner of this beautiful boat, called "Never Never Land", is very fond of fishing and several solutions reflect his passion. This pilot boat is fitted with a multi-function cabinet in the cockpit with sink, refrigerator, freezer and worktop, a chest of drawers for baits and a special storing solution for Rapala baits. The third cabin was transformed into a storing area for fishing rods and fishing equipment, the big hatch in the aft transom may be used to board the catch, storage space includes several lockers and a tackle compartment with access under the flying bridge ladder. Interior layout is sophisticated with cozy and ample spaces marked by modern and practical solutions. The open galley, to the side of the lower helm station, has a very large refrigerator/freezer and the compartment to one side of the big engine room is fitted with washing machine and dryer. 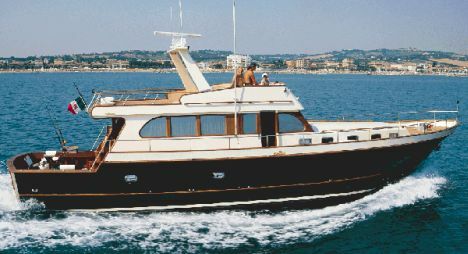 Last but not least, the yard highlights the extremely balanced boat's power, hull and waterlines. Fuel consumption at cruising speed, with a full boat displacement of 38.38 tons, is equal to 10 gallons/hour, this means a range of approximately 300 hours. so much sea to cross with this "Azure" boat! Total engines and reduction gears weight: 3,007 lbs. 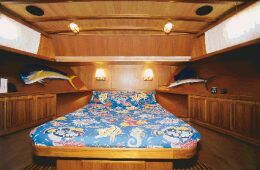 Notes: the tested boat has a tackle storage area in lieu of the standard version's third cabin with twin beds or two overlapping beds. 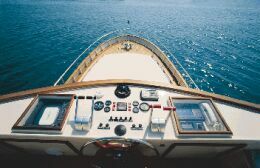 Flying bridge arrangement and characteristics: dashboard with power-assisted hydraulic wheel steering, hydraulic remote controls, compass, instruments indicators, pilot's seat, two settees on the sides, teak deck, roll bar. Standard fittings: air conditioning, Marinco 26-gallon/hr desalination plant, 12-kW Onam generator, washing machine and dryer in engine room, bow prop. Seakeeping ability, turning and behavior on waves: this boat was created as a function of precise characteristics. She is very stable, safe and may sail in any sea and weather conditions. Visibility in different weather conditions: excellent both from the flying bridge as well as from the salon. 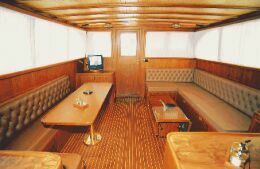 Passengers' comfort: excellent, the boat is very "relaxing"
Electrical switchboard and plants: very well positioned aft of the lower helm station, with top-quality wiring.